A Google search for quotes on giving back returns millions of results in a mere seconds. Obviously, giving back is a large part of many lives. At DMS Connect, our staff all give back in their own ways – through coaching kids teams, volunteering at the local theater, counselling those in need, etc. In addition, the team likes to support a cause or two throughout the year and rally our network (REALTORS® across Canada) to help us in our support. It feels really great to see our ideas and plans grow and turn into more than an office-wide feat. We greatly appreciate the folks (in our community and across the country) that step up to support our causes as well as their own. 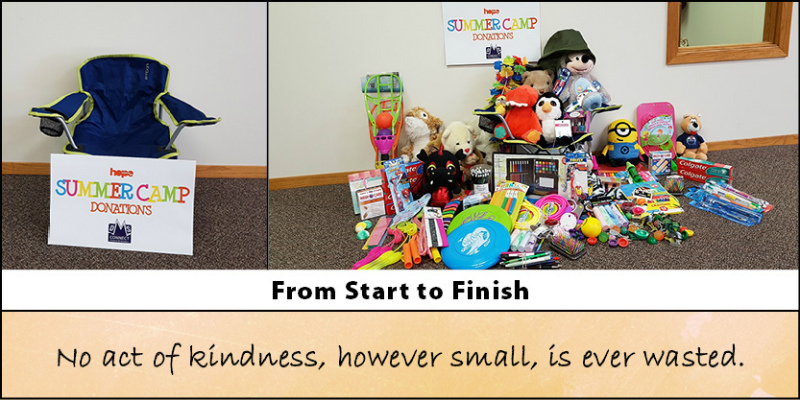 Over the last couple of weeks we, at DMS Connect, have rallied behind the Edmonton Hope Mission in a campaign to provide kids going to summer camp with the essentials (and extras) to make their camp experience one not to forget. Our camp chair quickly became overwhelmed with stuffed animals, toys, hygiene and art supplies. It was a heartwarming sight to see colleagues and friends come in with donations to support our drive. Thank you to those who stopped by and to those who liked, shared and mentioned our efforts via our Facebook posts. We want to know: How is giving back a part of your life? Comment below or on our Facebook page.